A theoretical description of decentralized dynamics within linearly coupled, one-dimensional oscillators (agents) with up to next-nearest-neighbor interaction is given. Conditions for stability of such system are presented. Our results indicate that the stable systems have response that grow at least linearly in the system size. We give criteria when this is the case. The dynamics of these systems can be described with traveling waves with strong damping in the high frequencies. Depending on the system parameters, two types of solutions have been found: damped oscillations and reflectionless waves. The latter is a novel result and a feature of systems with at least next-nearest-neighbor interactions. Analytical predictions are tested in numerical simulations. Herbrych, J., Chazirakis, A. G., Christakis, N., & Veerman, J. J. P. (2015). 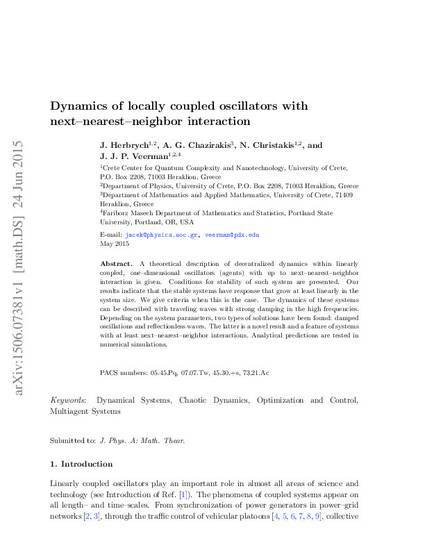 Dynamics of locally coupled oscillators with next-nearest-neighbor interaction. arXiv preprint arXiv:1506.07381.